Some anglers never have any use for GPS; they fish well-marked rivers in areas with excellent maps. But not everyone’s local water fits that profile; in the Appalachians from Georgia to Maine, in the Bighorns or the Wind River Range, and in large swathes of our national parks, it’s still extremely possible to get lost. The worst places for losing one’s sense of direction are forested mountains; the trees keep you from getting your bearings, while practically every little creek looks the same as every other little creek. In those situations, GPS is very useful. Deciding on GPS units can be complicated: Do I need a radio? What about a color screen? Will I use the voice navigation? Should I get a trail model only, or a road/trail model that can do double duty? Here’s a quick run down, drawn from my experiences with my GPS units, the Garmin Nuvi series ($100-300) and the Garmin Rino 520HCx ($450). First things first, leave the road navigation to the cheaper car units (Garmin Nuvi, TomTom, etc.) With spoken voice commands and big, bright screens, those models are great for road driving and terrible for trail navigation. With rugged builds, powerful receivers, long-lasting batteries, and the ability to make custom tracks, trail units are the exact opposite (terrible for road driving, great at everything else). Second, unless you’re navigating wide-open areas, you can skip the radio feature. My Rino 520HCx has a theoretical walkie-talkie range of over 8 miles, but it can’t punch through more than a few hundred yards of forested Appalachian woods (testing with Motorola walkie-talkies of similar advertised signal strength). Next, you WILL use the waterproofing, whether you plan to or not, so choose your unit accordingly. Some units, like the Garmin Rino and Astro series, can track the location of other units, including those mounted on a dog collar, which is nice in hunting season (but very expensive, since you need multiple high-end units). Finally, choose a GPS that communicates easily with Google Earth (unquestionably the best mapping software out there, full stop, and free to boot), and learn to upload your tracks. 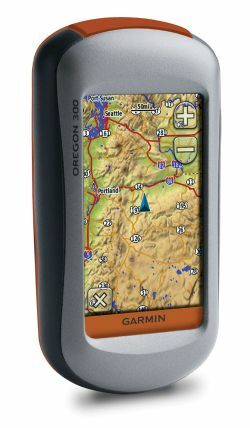 For my money, doing it over again, I would skip the Rino (left) and choose one of Garmin’s Oregon or Colorado models. Their smaller profile and updated color screens (with higher-res maps) make them the better buy. 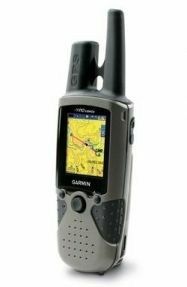 Currently, Garmin remains the clear leader in the trail GPS unit market. But, if your ex-wife works for Garmin or you just can’t stomach the purchase, take a look at the Magellan Triton or the Bushnell Onix series. Or, if you are willing to risk the loss of an expensive smartphone, consider the iPhone or a GPS-equipped Blackberry. Just don’t expect these units to accept topographic map uploads or know the location of trails in the backcountry. Have a recommendation or a word of caution about buying a GPS unit? Share it in the Comments section!